While on vacation (and staring at the beautiful ocean last week) I was reminded of a few really stellar outdoor installation artists and the amazing natural materials that can be used to get creative. The tot spent hours and hours finding sticks to use for drawing in the sand, and the last day of our vacation, really got into collecting rocks, checking them out, and then giving them a toss into the big collections rocks around the beach. Since we’ve been home, no one’s been really excited with our “real lives.” The beach was awesome, and who doesn’t love spending hours and hours on a desolated stretch of beach lounging about while chatting and reading and watching the tot do silly dances while loudly chanting the A,B,C’s? So the other afternoon during what should’ve been nap time (but had turned into toddler tantrum time) I got out the trusty laptop and scooped up the tot to check out a few examples of outdoor installation art by Robert Smithson. Born in New Jersey, this American artist is not only an artist artist, but also a published author. From poems to prose to outdoor installations, Smithson was a busy guy. His famous work, Spiral Jetty, was completed in 1970, created with mud and salt crystals in Utah’s Great Salt Lake. This curving length of sometimes exposed man-made earth was one of Smithson’s final creations and took six days to complete. After the tot and I spent a few moments checking out the different images of the Spiral Jetty, I shuffled her over to the table to get started on our own Robert Smithson inspired creations. Offer your child a sheet of white paper and a set of watercolor paints, a small container of water, and a big paintbrush. For the younger kiddies, this is a great opportunity for building color recognition skills. 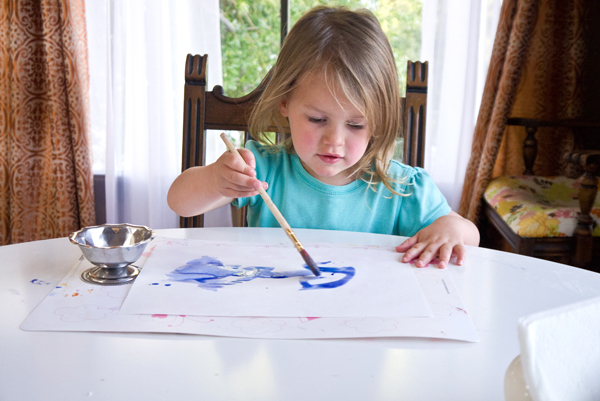 Invite your child to coat her paper with only blue watercolor paint. Older kids can concentrate on creating an area of blue that is representational of an ocean or large area of water, even adding details such as waves. The Spiral Jetty was created using mud and salt crystals, which might get kind of messy. 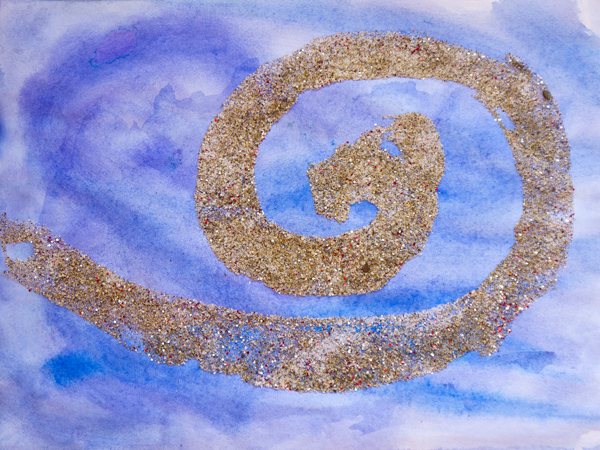 So, instead, gather together some glitter (I used silver and red), salt, and sand (like the stuff in the sandbox). You’ll need about 1 tablespoon of each. Have your child measure and then add the sand painting ingredients in a small bowl, which also enhances and encourages math skills. Invite your child to get out glue and a small container. She can squeeze out a good dollop of glue and then thin with a bit of water. Now get out that blue paper back, place a couple of sheets of newspaper underneath, and encourage your child to dip her big brush in that glue water and paint a big spiral on her paper, just like Robert Smithson’s Spiral Jetty. Invite her to sprinkle the sand mixture all over the glue water, totally honing her fine-motor skills. Leave the creation flat on the table for an hour or so and then your child can carefully lift up her paper (which can get a bit messy – hence the newspaper to catch all that leftover sand) and reveal her Robert Smithson artwork. Pour the remaining sand into a container for the next time your child feels like creating another sand painting and find the perfect spot for showcasing your child’s finished artwork. I wanted to make a nature collage, so I thought that maybe I could make it a sand painting. So I tried with some pencil sharpening, you know the small bits that comes out. There was a really good result!